Today Hon’ble Prime Minister Shri Narendra Modi visited Dumka, Jharkhand. On the occasion, five thousand households from BPL category were handed over LPG connection. 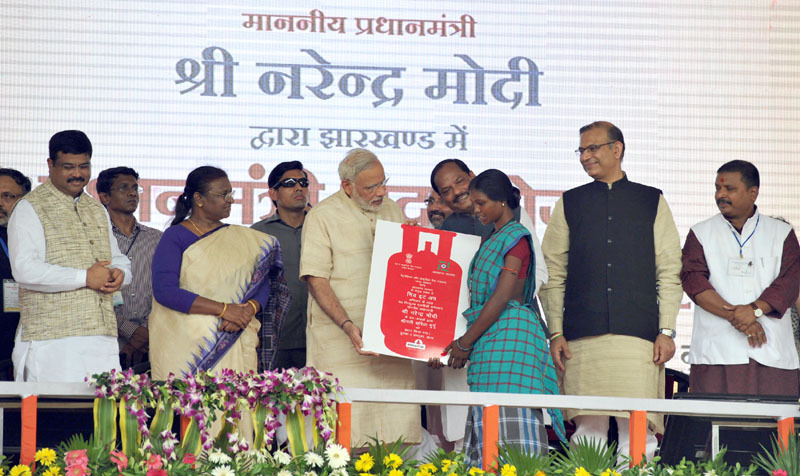 Hon’ble Prime Minister personally handed over LPG connections to four households at the event. 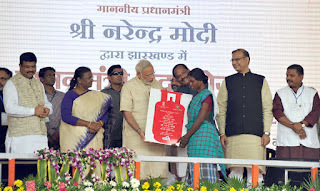 Hon’ble Prime Minister, while appealing to voluntarily Giving Up LPG subsidy on the day of Urja Sangam on March 27, 2015 had promised that the subsidy savings will be utilised to Give Back LPG connections to mothers and sisters from poor families. Today during the event he again reiterated the appeal and appreciated that above 30 lakh people have already given up LPG subsidy in such a short time. Under this Give Back scheme, Government of India has contributed Rs. 1600 per LPG connection to BPL household while Government of Jharkhand has contributed Rs. 918.50 per household connection. Minister of State for Petroleum & Natural Gas Shri Dharmendra Pradhan accompanied Hon’ble Prime Minister on the occasion.